The areas that they were about to explore had been seen by trappers, but none had ever made it to the Pacific Ocean. However, in 1793, a Scottish explorer had crossed what we now call Canada, and made it all the way to the Pacific Ocean. They would depart from St. Louis, Missouri in May of 1804, and spend the first winter camped across the Missouri River from a very large Mandan and Hidatsa Indian community. Here they were treated very well. It was also here that they were joined by Touissant Charbonneau, a trapper, and his 16 year old wife named Sacagawea. Sacagawea was a Shoshone, she had been taken captive by the Hidatsa's and sold to Charbonneau. 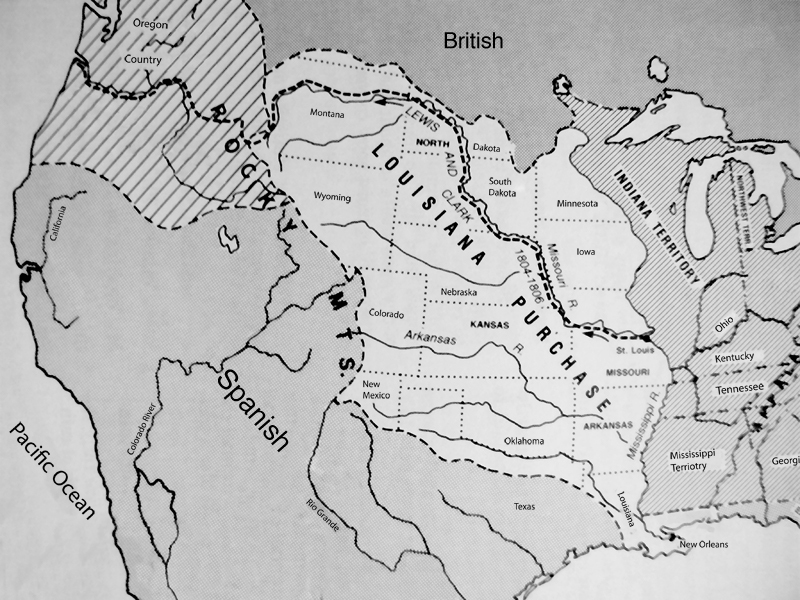 Sacagawea would travel with the Corps all the way to the Pacific Ocean. The Sioux, which controlled the Great Plains militarily, had a much harsher reaction to the Corps, as they were very hostile towards them. However, in the areas we now call Montana and Idaho they were warmly received by both the Nez Perce and the Shoshone tribes. Both tribes shared what little food they had with the Corps. Unfortunately, they were not treated this way by everyone. The second winter was very cold and harsh. They camped near the mouth of the Columbia River, in present day Oregon. The Chinook and Clatsop tribes, that inhabited this area charged the Corps exorbitant prices for goods. During the return trip, the explorers decided to split up as they again crossed Montana. They split because Meriwether Lewis wanted to conduct a survey of the upper portion of Maria's River in the northern section of the state. By doing this he hoped to extend the boundaries of the Louisiana Purchase. After having completed the survey, Meriwether and the 4 Corps members that accompanied him, crossed Two Medicine River, only to find 8 members of the Piegan Blackfeet tribe waiting on the other side with a large number of horses. That night they all camped together, and passed the peace pipe and exchanged gifts. The Piegan became hostile when they misinterpreted Meriwether's sign language, and just before dawn they attempted to steal the Corps horses and rifles. In the struggle that ensued, one of Piegen warriors shot at Captain Lewis. Lewis returned the gunfire hitting the shooter. In addition, during a fight for his life, Rueben Fields would kill one of the Piegan warriors. Afraid for their lives, the 5 men got on their horses and rode for over a 100 miles before making camp. The Corps of Discovery would finally return in September of 1806, with maps, sketches, and journals. They didn't make any important scientific discoveries, but they did open up this area for future explorers and fur traders.